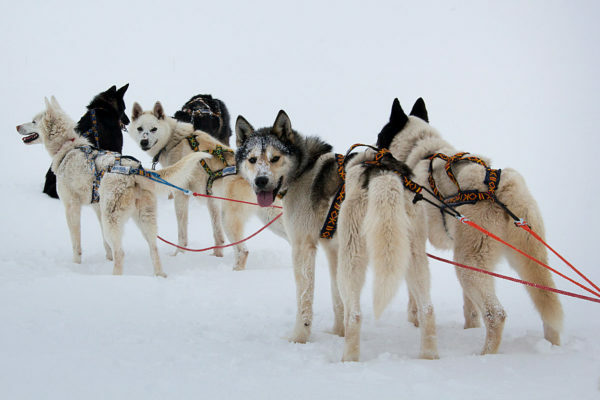 During the dog sledding trip you can either steer the sled or join as a passenger. Photo: Terje Rakke - Nordic Life. 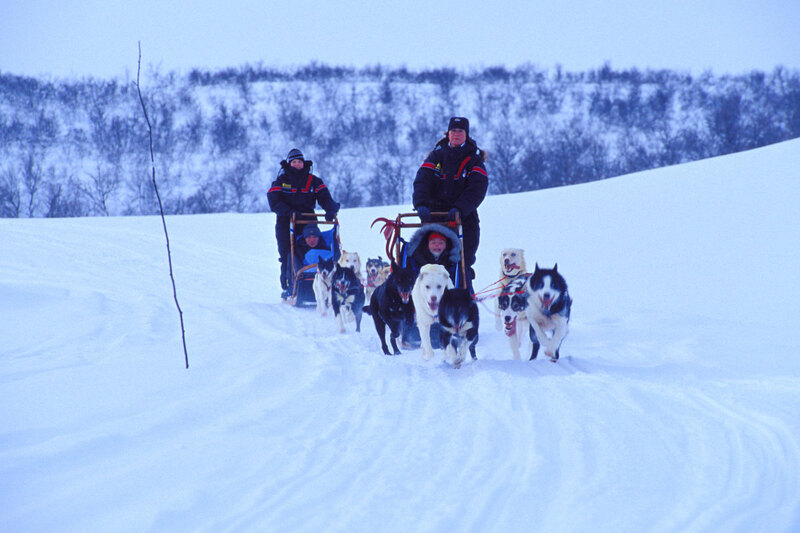 Scenic drive from Bodø: The dog sledding trip starts with an hour’s scenic drive from Bodo through changing countryside, offering panoramic views of suburbs, fjords and mountains. We will also visit Saltstraumen, the strongest maelstrom in the world. 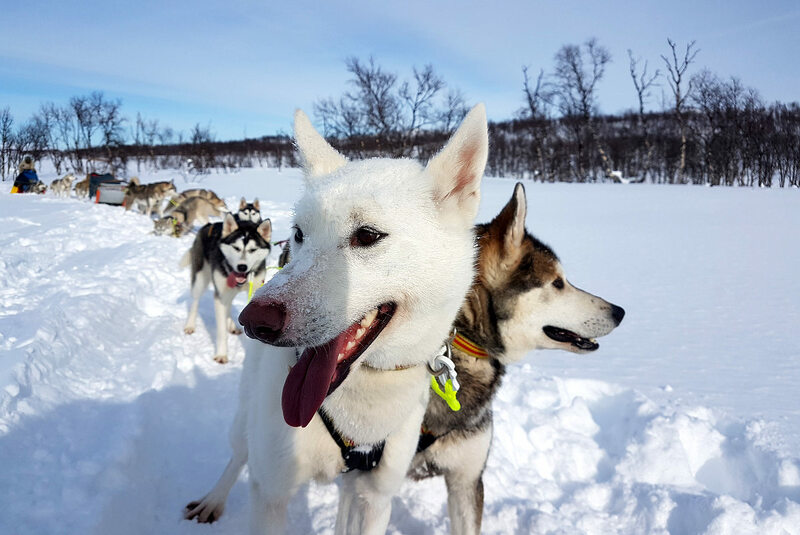 Meeting the dogs: Your dog sledding experience starts with meeting the dogs and preparing for the sled ride. They are a bunch of barking huskies eager to start the trip. Even though the dogs are noisy, they are friendly and pleased to see us. They are well used to visitors, great with children and love getting your attention and petting. The dogs love pulling your sled and can hardly wait to start the dog sledding trip. Photo: Marcela-Cardenas. Ready for the husky safari? You will now be advised how to harness the dogs, get instructions how to drive a dog sledding team and steer your sledge. Once everything is ready, the big moment arrives as your guide helps you launch your sled and off you go! Driving your own dog sled. Two persons share one dog team, you will have a chance to switch who is the driver and passenger. The dogs are now completely silent and all you can hear is their breathing. 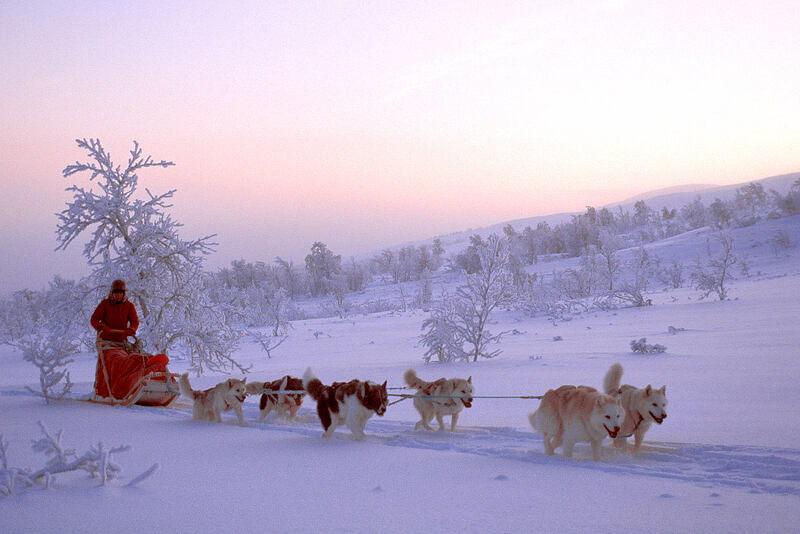 The dogs love pulling the sled and will understand your commands. The actual dog sledding will be 1-2 hours, depending on conditions. The dog sledding was awesome! We had an amazing time and the coordinators were knowledgeable, friendly and helpful. I can highly recommend this experience! A total of 6 - 8 hours, including transport from/to downtown Bodø. The actual dog sledding experience will be 1 - 2 h including preparations and meeting the dogs. 2 - 8 people. Larger groups on request. If you need transport by us from Bodo, then choose `Standard rate` when booking. Please see details in FAQ below. If you prefer to meet up where the sled ride starts, then choose `Meet on location` when booking. Please see details in FAQ below. Is this trip for me? This trip is designed for intermediates. You don’t need any specific skills, but good fitness and mobility are an advantage. The dogs do most of the work but the trip is somewhat physically demanding as you will need to help the dogs when we are going uphill. Minimum age: our recommended minimum age for dog sledding with children is around age 10. Your own gear suitable for winter. Good footwear (warm hiking boots or winter boots). 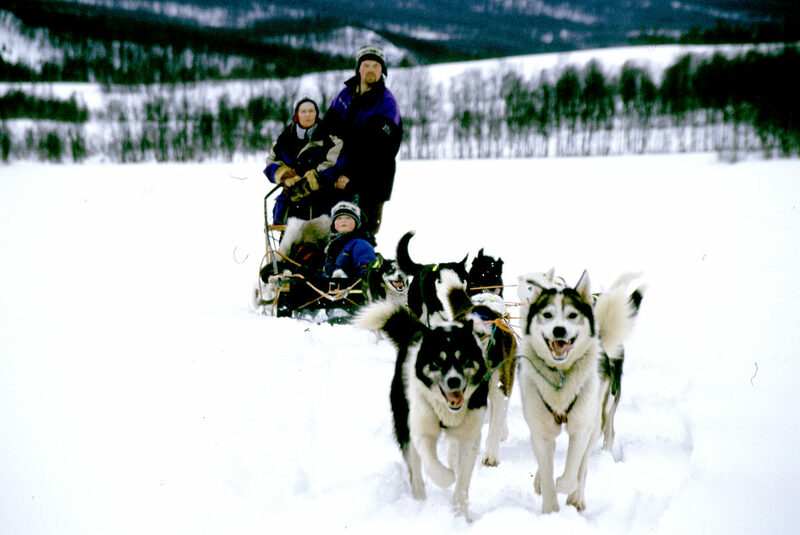 A knowledgeable, English-speaking guide with passion for dog sledding. If you do not need transportation back and forth from Bodø and want to meet up on location (e.g if you have a rental car) you simply choose `Meet on location` rather than `Standard rate` when booking. From Bodø via Saltstraumen: follow route 812 to Misvær village, then follow 812 for 8 km, turn right by sign marked `Vestvatn / Skianlegg / Arctic Cabins`, then 100 m and you will see a large red house on your left. If you get lost on the way please do not hesitate to call our office for help. From E6 Saltdal Valley: follow route 812 direction to Misvær, then follow 812 for 25 km, turn left by sign marked `Vestvatn / Skianlegg / Arctic Cabins`, then 100 m and you will see a large red house on your left. If you get lost on the way please do not hesitate to call our office for help. Meeting time: When meeting us on location: 11.00 am. Naturally, dog sledding requires snow! Bodø is located on the Northern Norwegian coast, which means the snow cover near the town centre varies during the wintertime. The dog sledding trip will be operated in inland areas with far more stable snow conditions. There is normally no need to cancel this trip due to weather. The only exception is extremely strong wind and/or heavy rain. If the weather gets too bad, we will consider choosing alternative routes or experiences. Want to Know More About the Dog Sledding Trip?